From jazz and blues in the Deep South to whale-watching in Alaska, the United States has everything you want for a holiday. The beauty of the National Parks is off the scale - watch the sun set through Delicate Arch in Utah for an unforgettable experience. Trips to the USA don't usually advertise themselves based on wildlife in particular. Yet no holiday would be complete without some fairly epic wildlife spotting. Forgetting Africa's 'Big 5' for a moment, these are the 5 biggest animals in the USA that you'll want to try and tick off your bucket list. Visiting the United States wouldn't be complete without attempting to spot (from a safe distance, of course) a bear. Grizzly, black or brown, North America is one of the best places to see bears, and no place more so than Yosemite National Park, where the black bear is ubiquitous. More than 90% of Yosemite is designated wilderness area, and on an Explore tour to Yosemite, the Explore Leaders always try to get our groups off the main tourist trails and into its natural charms. Another great option for spotting bears is Denali National Park, in Alaska, which has acres of rugged tundra to hide grizzly bears, as well as caribou, red foxes and over 160 different species of birds. Holidays in Alaska are great for wildlife spotting in general, but with bears you may even have the chance to see the salmon run - impressive enough in itself without the sight of a grizzly trying to catch his lunch. Cruising within the outstanding towering peaks and glaciers of the Kenai Fjords National Park in Alaska, you'll be on the look out for humpbacks and orcas, as well as other diverse sea life including porpoises, sea lions and puffins. Moving to the East Coast, a trip to Nantucket, near Cape Cod, is also a good spot for whale-watching in the USA. A more gruesome side to the town is that Nantucket has a strong background in whaling, and even has a whaling museum that provides an unglorified view of this history. The bison in Yellowstone National Park are part of the oldest and largest public herd in the USA, and are almost impossible to miss. 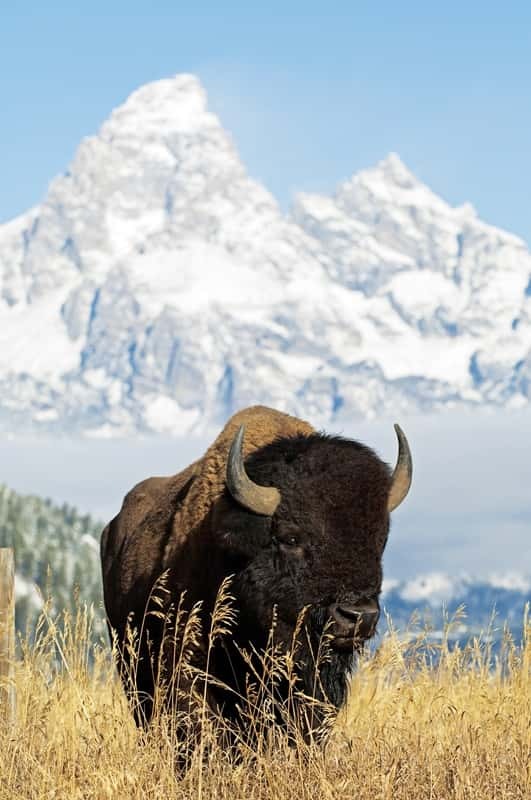 They are part of the park's landscape, but visitors to Yellowstone should be wary of approaching one - they can run up to 35 miles per hour and are aggressive if agitated. Is it a moose or an elk? Moose, elk and caribou are essentially different species of deer, of which moose is the largest variety. There are all sorts of behavioural differences to the three animals, as well as some physical differences - most notably in the shapes of the antlers. Moose antlers are broad and pointed, rather than elk and caribou whose antlers are more like tree branches. Playing the 'what deer' game is part of the fun of visiting places like Yellowstone, Baxter State Park in Maine, or in the Alaskan tundra. Visiting Olympic National Park in Washington State is a great place to view elk, being home to the Theodore Roosevelt elk, named after the former US president. Down in the swamps of the Bayou lie many creatures, from snapping turtles and raccoons to beavers and armadillos. No Explore holiday to New Orleans is complete without a swamp tour, where you can see the most famous of all - the alligator. This creature, indigenous to the swamps around Louisiana, Florida and Alabama, is so ubiquitous that gator soup is served in most of the restaurants in New Orleans, and the University of Florida's football team has taken the name of the Florida Gators.